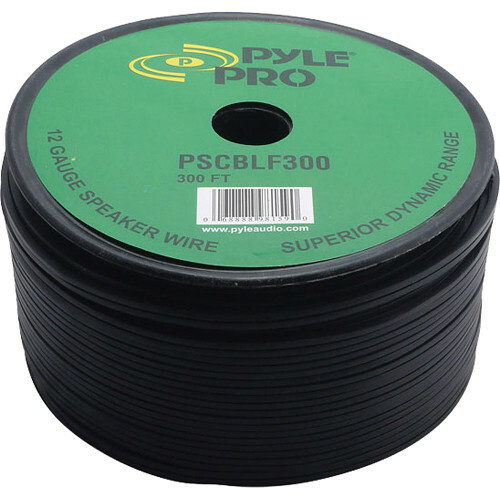 The PSCBLF300 12AWG Bulk Speaker Cable (300') from Pyle-Pro is a spool of bulk speaker wire that can be used for a variety of applications. The cable provides superior dynamic range and has unterminated ends. The rubber jacket provides excellent flexibility and durability. Box Dimensions (LxWxH) 7.1 x 7.0 x 3.7"
PSCBLF300 12AWG Bulk Speaker Cable (300') is rated 5.0 out of 5 by 1. Rated 5 out of 5 by Bernard from Pyle Bulk Cable I had a large installation to do and needed bulk speaker cable. I found this cable which was 12 AWG and ordered it. It was on sale and looked like a good quality cable. I have completed the wiring and this cable was excellent for the application I used it for which was wiring audio in a large room (56'X43') and a second (23'X32'. I would definitely recommend this for anyone doing a speaker wiring job, industrial or private.